I didn’t have very long to explore Amsterdam’s speciality coffee scene when I visited the city for the World of Coffee in June, but I noticed that the majority of places are outside of the centre, often to the south or west. 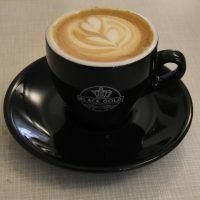 In contrast, Black Gold, on a quiet, residential street, is just a short walk east of the red light district, making it one of the more easily-accessible speciality coffee shops for those on a more traditional tourist itinerary. Black Gold is both a coffee shop and vinyl record shop, part of a small band of such establishments around the world. The front is given over the vinyl, although there is some seating and you are welcome to sit there with your coffee. Alternatively, there are a few more seats in the spacious rear of the shop. When it comes to coffee, Black Gold uses local roasters White Label Coffee, with a single-origin on espresso, where it’s joined by a guest roaster. There are also three single-origins on filter through V60, Aeropress, cafetiere and batch-brew, with the same single-origin guest espresso also available as one of the filter options, an innovation which only started in June.